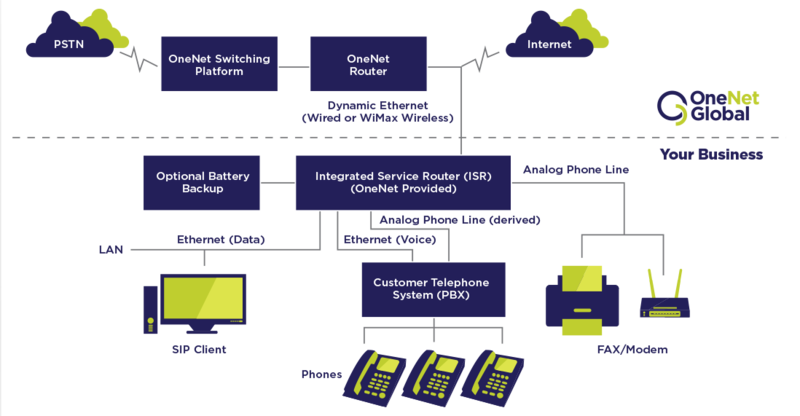 OneNet’s Flex T-1 delivers high-speed, scalable bandwidth shared between voice and internet. This business-class service is dedicated to the customer and is symmetrical with simultaneous download and upload speeds at any given time. Unlike an Integrated T-1, unused voice channels won’t sit idle — as voice calls connect and disconnect, bandwidth is dynamically allocated to internet. Flex T-is are designed to connect to customer’s telephone system (PBX) via standard CAS or PRI interfaces. G.711 codec provides uncompressed high quality voice. G.711 generally supports analog service such as fax, modems, alarm lines and credit card machines, however if customers experience continuous problems on a Dynamic T-1, the fax/modem will be converted to an analog line which takes up to 7 days, barring facility issues. G.729 codec provides compressed voice with less fidelity than a G.711 codec or normal analog phone lines. G.729 does not support fax, modems, alarm lines or credit card machines. OneNet will automatically adjust to G.711 in the event that fax and modem tones are detected, however, is best effort for fax, modem, alarm or other analog devices when using G.729. The voice codec selected by the customer has a direct impact on the number of voice calls available and the amount of internet bandwidth available.